We had a late morning and breakfast in the cockpit. We took a little walk before we cast off south to discover Hamburgsund. We saw that it was very dark sky north so therefore we decided to go south. We did not know were to stop but we needed to plan so Johan can be picked up the 5/8. When passing Dannemark we saw a boat leaving the boj so we decided stop for a while. The weather become better so we decided to stay over night. 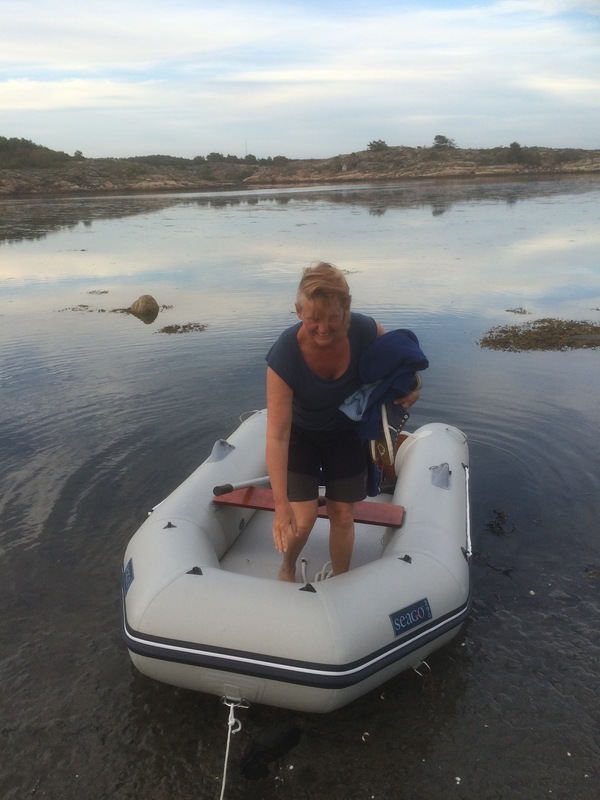 Johan and I prepared the rubber boat and tried to get the engine to work. We could not manage the engine so we needed to use the oars. Johan made a bag of 1 beer and one sandwhich and them he went. Into the Island to make a walk while Anna and I had a nice time on the boat. The evening was spenat in the cockpit with a lot of gin and discussions. Anna went to ned while Johan and I was discussing various matters. Late IT started to rain and become completely dark. The sky was blue and the wind approx 4-5 MS.
We had a slow start in nice weather before we left Smögen towards Basteviksholmarna. We went west and off shore on our way back while Catrin and David did the steering. We made an extra tour towards Lysekil before going north towards our Harbour were we said farwell to our french friends. Johan, Thomas and Paula arrived and we showed them the boat and had some coffe before Thomas and Paula left and we cast off. We decided to go west of Hållö heading straigh north. We started to try to find a ”naturhamn” SW of hamburgön but as the the was late they were all buzy. We had a nice dinner and Johan and Anna stayed up very late discussing politics while I went to bed.